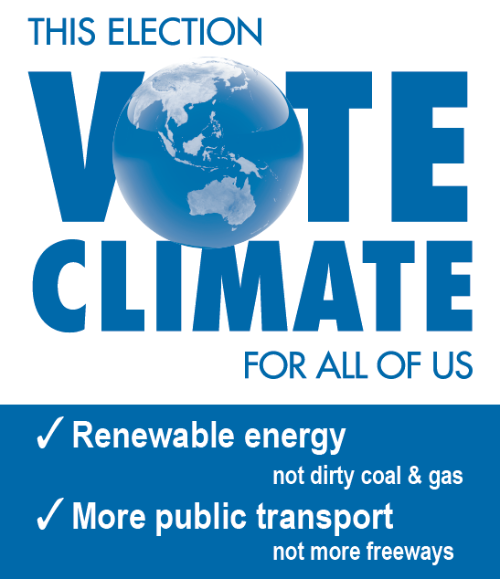 Show your local Victorian election candidates that you care about climate change. Tell your neighbours that you will be putting climate first when you vote. There's no issue more important for our future and the futures of our children. If you live in the City of Darebin, email your local climate group Darebin Climate Action Now and they will deliver a house sign to you. If you live in the City of Yarra, contact Yarra Climate Action Now. If you live in Moreland, contact Moreland Climate Action Now. Other groups which may be able to help you get a sign are: Lighter Footprints in eastern Melbourne, Geelong Sustainability Group and Bendigo Sustainability Group. If you are not near a group which has a supply of signs, you can download a design and get it printed and laminated yourself. Download the design shown in the picture on the right.